Driving time about 45 minutes (50km) from Gisborne. 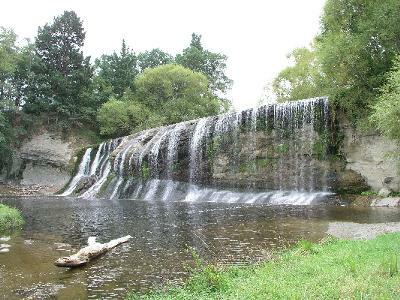 Rere Falls are in North Island, to the west of Gisborne and to the south of SH2. Joyce and visited these falls towards the end of March 2010. From Gisborne take SH2 towards Wairoa. At the Waipoa Bridge roundabout turn right onto Wharekopae Road towards Patutahi. Keep on Wharekopae Road and follow the signs for East Woodhill Arboretum. Continue past the arboretum for perhaps another 15km to Rere. The falls are on the left shortly after Rere. There is a picnic area at the falls. The road beyond the falls is unsealed, but does eventually lead onto SH2 at Motu Bridge. We had travelled from Wairoa, and were heading for Gisborne. We opted to visit East Woodhill Arboretum. We chose to take a high path for a view over the arboretum. This was a mistake. There are many places in NZ where you can walk through sheep pasture without paying an entrance fee. Also when we got to the top it began to rain with increasing intensity. We were therefore unable to fully appreciate the more interesting and sheep free lower sections of the arboretum on our way out. In short we got soaked.